Loft and roof spray foam insulation contractor - service in Cambridge, Ely, Newmarket, Huntingdon, London, Brandon, Mildenhall ( Cambridgeshire, Norfolk, Suffolk , East Anglia ) Polyurethane expanding spray foam insulation for Marine, Home, Boats and Containers. Wall and Loft insulation Timber frame foam insulation Domestic and commercial foam insulation. Polyurethane expanding spray foam insulation for Marine, Home, Boats, Agriculture and Commercial Buildings. Wall and Loft foam insulation service. Timber frame foam insulation service. 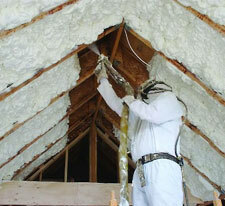 Domestic and commercial foam insulation service. 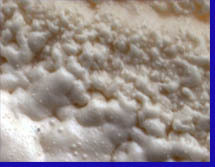 Polyurethane Foam is spray applied as a liquid and expands as a foam. As such it fills every single nook, cranny, crevice, hole, crack, and gap making a perfect continuous air-tight seal every time, regardless of complex framing and penetrations. Fiber Insulation such as Fiberglass, Cellulose, and Rockwool merely slow down convection which accounts for 80% of heat loss. As the temperature drops, convection currents speed up and Fiber Insulation loose their effectiveness at slowing them down. Foam on the other hand stops convection. Wind is not a factor either for Foam due to its continuous air-tight seal. Polyurethane Foam is its own building code approvedThermal Insulation, Air Barrier, and Vapour Barrier. It's closed cell structure stops convection currents, which eliminates condensation, moisture, and mold. Polyurethane Foam adds structural strength to a building. It's rigid structure increases shear and racking strength by 300%. Polyurethane Foam improves indoor air quality and comfort. Since it creates a continuous air-tight seal, dust and other exterior pollutants cannot enter the building. Polyurethane Foam increases comfort by decreasing noise. A building sprayed with Foam is much quieter; it decreases the noise from both the exterior environment and interior mechanical systems. Area Covered: Cambridgeshire, Norfolk, Suffolk, ...East Anglia and London.